Today’s post with the Syracuse New Times is a risk. It’s different. It’s something that people are not going to expect, and they might be turned off a bit about it. My brother’s engagement has been the talk and talk of life for almost two weeks now. For next year’s big event, there is a lot to do, not me personally, but it’s understood. I cannot help but listen and talk about, because I love these two. I’ve been searching for photographers and other ideas that they could use and maybe make happen themselves. Down the road, I’d like to be married myself, so helping out is necessary for a learning experience. A recent post by Jennie Saia at Tip of My Tongue helped persuade me into writing the poem despite it not having anything to do with life in Syracuse. The Espresso Shot is a thought-provoked micro blog; it’s not supposed to be long. Also, before I share the link to the post, tomorrow we have a surprise. It’s a guest post. A woman adds another segment of her life on the pages of this bottomless blog, adding to the flavor of life as we know it. Life is personal progress, but we’re not in this and on the planet all alone. It’s interesting to hear another’s story, how they tell it and how they’re cut-and-dry or flowery when telling it. It’s how we interact and communicate with others, how our lives intertwine. There is a blatant hint given in this post as to who this guest is. 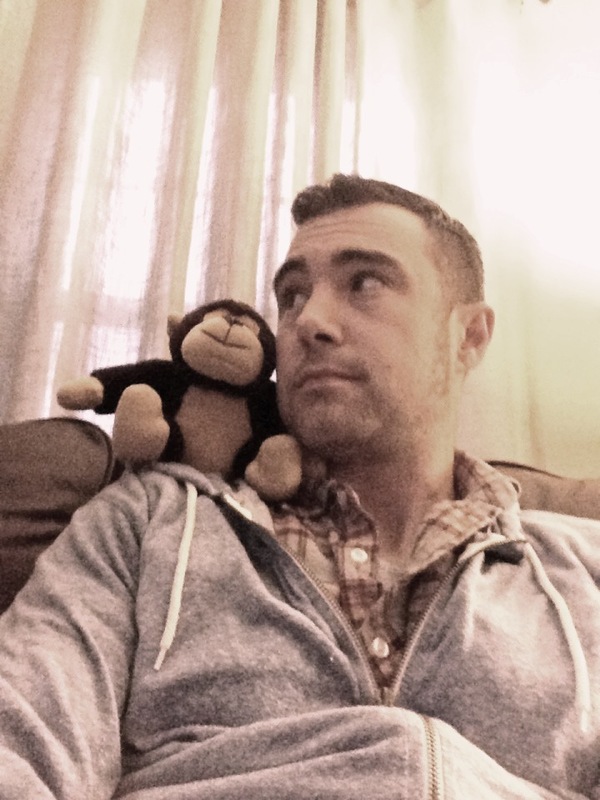 The monkey is off my back for now … it’s sitting on my shoulder. See you Saturday. Thank you, Angelle! It means a lot hearing from you. Wow, July is right around the corner. At least things are going easy, and I hope things are going smoothly. How excited are you? Ah, good ol New Orleans. You’re going to have a blast. You’re allowed to girl out. It’s healthy. I can’t. People will look at me strange. 1. The sonnet. Well done, Chris. Risk taken, rewarded, appreciated. How come I am the only man manly enough to love a poem about love? Or, at least, publicly profess such admiration on your blog here. Come on WP males. Oh, I forgot, you and I and Jim McKeever and Lance …. Trey …. Not many of us in comparison. 2. Your hint was more like a sledgehammer. I will be reading our friend here tomorrow. 3. Uh, no 3. Except sorry I didn’t get to your two blogs until so late today. 1. Not sure. You’re one of the only males… you might be the only male… who comments on my blog. You are also one of the few people who will justifiably call me out on things. So, I thank you several times over. 3. It’s okay. There were no worries… Well, I only worried a little bit with a slight lip quiver. I figured you were busy. OK, quiz. How many bands can you name who recorded the song “One Monkey,” as in, “don’t stop no show,” Chris? Ready, set, go. You can’t see me, but I have a look of panic on my face. I have no idea. I’ll start with Bette Midler because she sang it really loud and nobody else really had to, but a lot more did. Yeah. I just Googled the song. A lot of people definitely sang it. I definitely failed this quiz. But you definitely passed the monkey on your shoulder photo test. Oh, wow. Apparently I caught a renegade Bette on that song. I just Googled it. She’s not even on wiki page. I love me some ee cummings and I’m loving me some of your sonnet on SNT. *sigh* *swoon* It’s beautiful. I adore e.e. cummings, darling; and was the leaves of grass an intentional Whitman nod, or no? Anyway, I thought it lovely, and will see you here tomorrow. Oh, definitely a Whitman nod. I can’t get anything past you. OK, seems I can’t comment on the poem itself, so here I am again! I really, deeply enjoyed your sonnet. And I say that as someone who very rarely likes poetry found on WordPress, and knows how the page views drop whenever you’re actually brave enough to publish some… so I’m even happier to have had added some small spark to that tank of explosive words you had waiting. Yeah. The SNT has prohibited comments. The paper is trying to establish a system where people can comment and communicate appropriately. I believe a paper in Chicago has done the same with their online portion. The comments on Syracuse.com — despite being very funny at times — can get rude and be immature. I’m glad you enjoyed the sonnet! I haven’t posted anything remotely poetic in a while, and your post was the tipping point to entice me into doing something a little romantic. The poets of the WordPress world are very hit-and-miss. I respect and applaud those writing poetry with a stream of consciousness style; a lot of my writing is a stream. However, as far as “good poetry” goes, some of the poems are not good. People may not like this honesty, but… hey. I can’t see someone posting one poem a day — yet some even post three or four — and thinking everything they write is good is beyond me. I wish I had that confidence. I know a lot of what I write isn’t that great, but I’ve limited myself to writing. I want to take my time and have words count. Yes. Agreed. When I do have a poetry moment, the words come pretty quickly and I machine gun them onto the paper before I lose them. But that only happens a few times a year, and I always wait a few days before publishing to edit a word or two obsessively every few hours. No one can crank out good work with that kind of frequency unless they’re a factory, and I don’t need more plastic tchotchkes. Ahhhhh it’s Tracy Fulks Tracy Fulks!! I mean… I think. Starting the day with a tear in my eye. Beautiful piece on the SNT. I apologize for taking so long to respond. I had to catch up with blogs — a day old or so as well as new — before reviewing my post. The only issue I have is finding someone to marry. Hahaha. I’m taking notes for certain. One cannot be too prepared. Jennie is great. I think you’ll enjoy her. That’s where the monkey is going to stay. My back isn’t that big for too many chimps.